A very interesting article appeared in the Mmegi Online magazine out of Botswana. The subject was the new African Women's Chess Champion, Tuduetso Sabure. Titled, "Success in the Face of Frustrations," the article highlighted her beginnings in chess, challenges and triumphs in Botswana, professional ambitions and travels to the African Championships. Sabure and other Botswana players drove 1500 kilometers (900+ miles) to Lusaka, Zambia and were exhausted upon arrival. She called the trip a "nightmare." Also mentioned was the fact that very little preparation was done for the tournament and that her training resources were below standard. "Things are really tough for a chess player in this country," she stated. Perhaps mostly telling in the article were her frank views on women's chess. This has been a heated topic for the past year and her views are as provocative as the discussions. For example, she took issue with the upcoming FIDE World Cup Championship which features 128 players and only one woman, FIDE Women's champion, Antoaneta Stefanova of Bulgaria. "They said for us to play for that tournament, we should play in the men's section of the Africa championships. We found it very discriminatory to women. FIDE could run the women section of the World championships at the same time with the men's section just like it happens at the Olympiad," the 23-year old was quoted as saying. It goes without saying that much of the focus in chess goes toward the male-dominated circuit, but there has been a raging debate on blogs and discussion boards as to whether there should be gender-separated tournaments since chess is not based on physical abilities where men would hold an obvious advantage. Initially, Sabure had declined to travel because of her exams, but decided to take the tortuous road to the championship and came back with the continental title and also the coveted Women's International Master title. She also won US$1500, but had to spend some on a plane fare to Botswana to make her exams. However, with all of the challenges facing Sabure, she has made a great result and hopefully this will mean more opportunities for her in the future. Congratulations to Tuduetso Sabure! Read Monkagedi Gaotlhobogwe's, "Success in the Face of Frustrations," Mmegi/The Reporter, 18 November 2005 (Gaborone, Botswana). 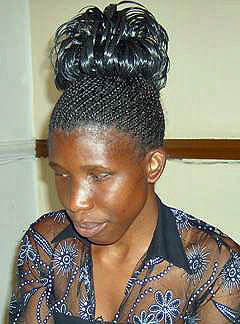 Monkagedi Gaotlobogwe, "Sabure: Top of Female Chess," 24 October 2005. Kenneth Boikhutswane, "Sabure Leads at African Chess Event," 11 November 2005.